After months of anticipation, Apple may finally be on the verge of releasing its HomePod smart speaker. Earlier today we reported that clues along the Apple supply line suggest that the device might ship in February, and this afternoon word dropped that Apple had finally gained approval from the US Federal Communications Commission (FCC) for the device. In the official FCC filing, the device is referred to as the "Apple Inc. Wireless Speaker," with a code name of A1639. Accompanying product diagrams almost certainly confirm that it's the same device that we've seen discussed since June of last year. As MacRumors notes, for instance, the iPhone X secured FCC approval on October 4 and was available to the public beginning November 3. 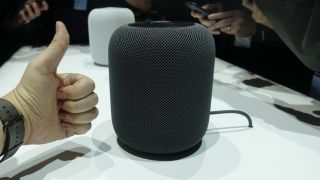 It's possible that we won't see that quick of a turnaround for the HomePod, but the FCC approval suggests that Apple might meet its updated "Early 2018" HomePod release date for customers in the US, the UK and Australia after all. As a downside, an "Early 2018" release window would still be applicable months after the current rough winter is only a memory. Other complications that prevent the HomePod from releasing in a timely manner could also still be on the horizon, of course. Considering that smart speakers like the Amazon Echo and the Echo Dot already saw massive sales last December, Apple should probably get its latest device in homes before it gets left in the wake. Here's to hoping the February rumors have some truth to them.